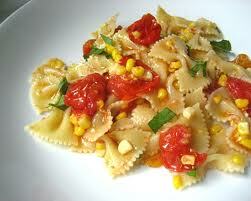 This recipe makes the most of local farm-fresh ingredients such as cherry tomatoes and corn. Roasting the corn and tomatoes enhances their flavor, and the little ear-shaped pieces of pasta serve as perfect nests for the sauce. Serve with a salad for a quick, easy and light meal. Preheat the oven to 400 degrees. Line a large rimmed baking sheet with aluminum foil. Place the tomatoes and ears of corn in a large plastic food storage bag. Add 1 tablespoon of the olive oil and massage lightly to coat evenly, then spread the tomatoes and corn on the baking sheet in a single layer. Use a sharp-pointed knife to poke a little slit in each tomato. Roast for 15 to 20 minutes, until the tomatoes expel some of their juice and begin to char. Transfer the baking sheet to the stovetop and let the vegetables cool for 5 to 10 minutes. Remove the corn kernels from the cobs by holding the ears upright and gliding a sharp knife down the sides; discard the cobs. Bring a large pot of salted water to a boil over high heat; cook the pasta according to package directions. Drain pasta, reserving 1 cup of the cooking water. In a large saucepan over medium heat, combine the remaining tablespoon of oil and the garlic; cook, stirring, for 1 to 2 minutes, until fragrant. Increase the heat to medium-high; add the corn, tomatoes and any accumulated juices from the baking sheet to the saucepan. Cook, stirring, for 1 minute to incorporate the flavors, then add the cooked pasta and toss to combine. Add 1/4 to 3/4 cup of the pasta cooking water, as needed, to moisten. Season with salt and pepper to taste. Remove from the heat and add the cheese and basil, tossing to combine. Add the remaining pasta water as needed. Divide among individual plates; garnish with additional basil. Serve hot, warm or at room temperature.